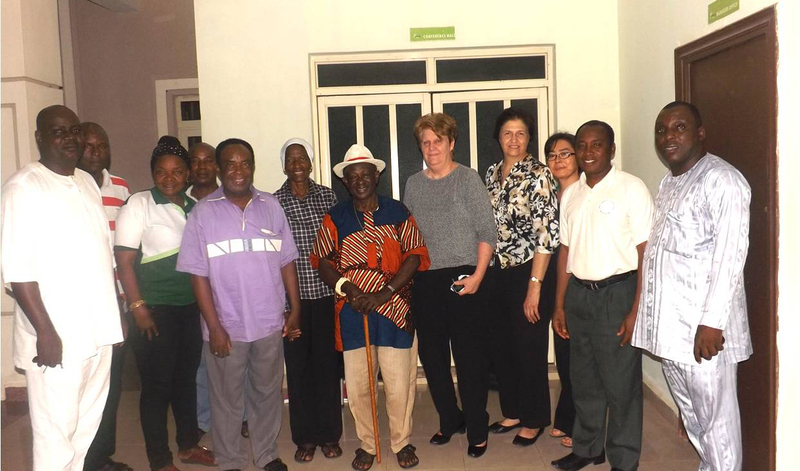 FFWPU Nigeria: In October 2015, True Mother sent Dr. Yong Chung Shik, Continental President and Special Emissary for Asia to hold a special workshop on how to accomplish Heavenly Tribal Messiahship in Nigeria. Together with Dr. Cho Dong Ho, Regional President of West Africa and myself, we had decided to study the Asian victory method. For 2 days we participated in such an inspiring presentation by Dr. Yong and by Rev. Malicdem, Special Envoy to the Philippines. Everyone was totally captured by this education and we set forth to begin our mobilization after this life transforming seminar. On November 7th, 2015, we held our launching blessing in an area of Nigeria called Yala with a population of over 280,000 people. Yala is the hometown of several of our FFWPU members in Nigeria of the Oko Family. Centering on Raphael- and these Oko family members have been working for a couple of years to lay a strong foundation in their area starting with their physical family and progressing to the Paramount Ruler of Yala and 12 additional Traditional Chiefs and the population in general. So we decided to start on this foundation in Yala. During the week of November 7th, we have blessed 204 couples from this area and also in Abuja, the capital city. 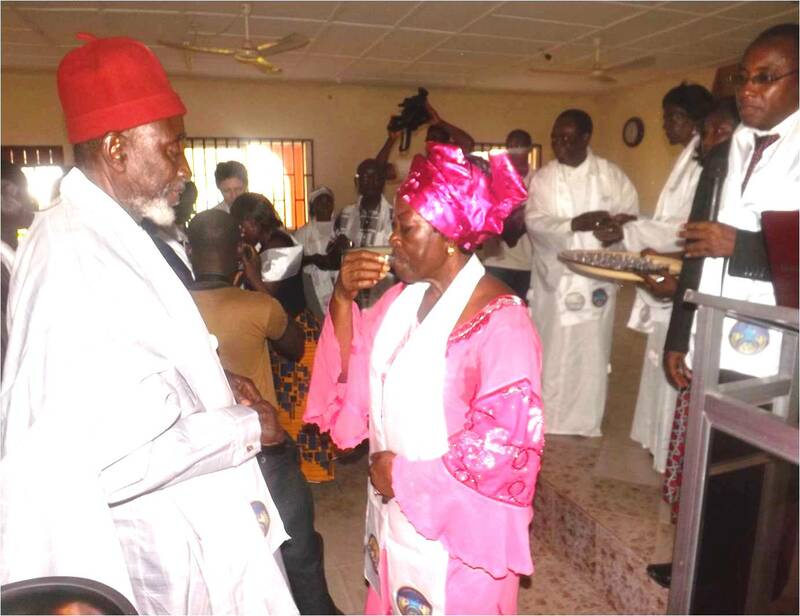 During the launching blessing on Saturday, Nov. 7th, 36 mobilization couples were blessed together with 12 traditional rulers, the paramount ruler and 8 Christian pastors and other general couples from the area. The couples that received the blessing on Saturday began immediately their 40-day separation period that will end with the three-day ceremony. All couples received education through workshops before the event and were eager to renew their family values thru this blessing. They are grateful to our True Parents to give them this opportunity for rebirth. The “36 couples” that were specially chosen have begun to work full time in the mobilization period from November 7th to January 8th, 2016. There are an additional 7 couples working in Abuja and Cross River State using the same pattern. Each of these district organizers has a goal to fulfill 120 couples before January 8th, 2016 so that these new couples will be able to finish their 40-day separation period and 3 day ceremony before Foundation Day 2016! At the same time, we have core members from FFWPU Nigeria mobilized in Akwa Ibom State, Lagos State, Rivers State and the capital city of Abuja. We are also working with the NCLC (Nigerian Clergy Leadership Conference) (our own organization) to continue blessings in churches and mosques through Nigeria. We have already held a workshop with over 21 pastors throughout Nigeria and will hold a launching NCLC blessing this coming weekend. 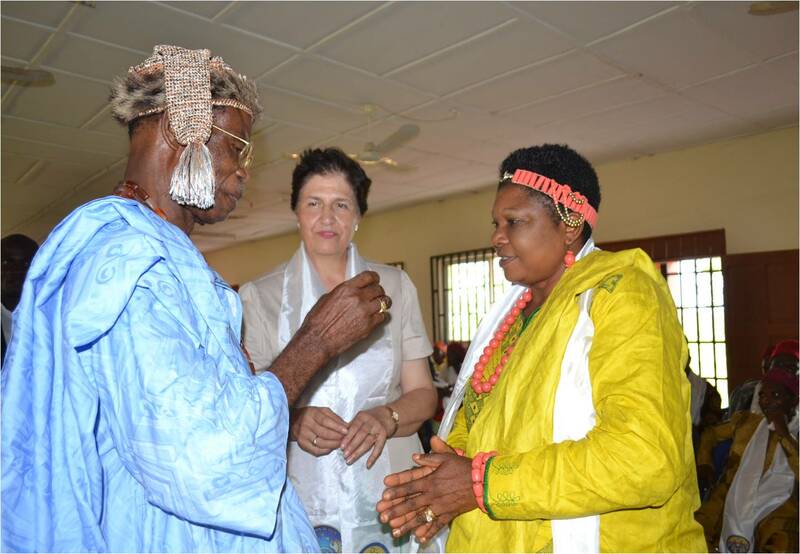 During the preparation for the ceremony, we asked these tribal leaders to find 12 virgins between the ages of 13 years old to 21 years old who could determine to keep their purity until marriage. In the beginning, they told us they would have difficulty finding any virgins at all! But they told us they would research and get back to us. Two days before the blessing, they called us to tell us that they had found 33 virgin young people who wanted to view the blessing ceremony and who would take the pure love pledge, vowing to live their lives purely until they receive the blessing and can create God-centered ideal families. 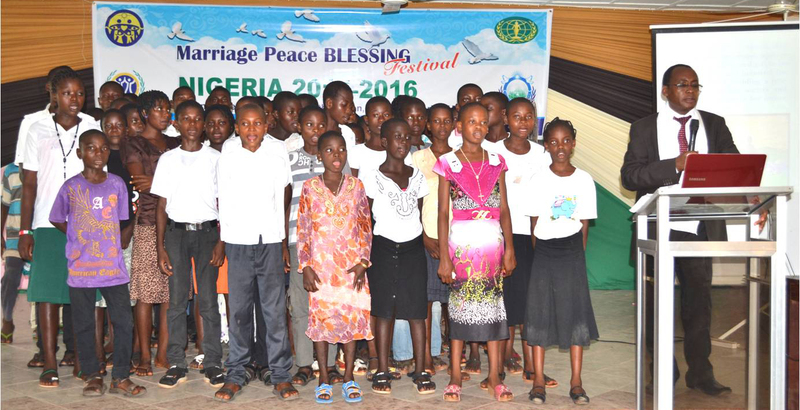 So 33 young people also came and recited the pure love pledge. It was very moving. Even the tribal leaders were moved to see these young people vowing to live exemplary lives! Also, 12 tribal leaders received Ambassador for Peace Awards at the end of the Indemnity Stick Ceremony (Tangam Ceremony) that we all did together. Our Headquarters in Nigeria has temporarily moved to Yala to conduct the major part of this initial mobilization period from there. One interesting story is that the NTA (Nigerian National Television Authority) came to the blessing to record what we are doing and broadcast it on Television. While we were helping the couples to arrange their hands together for True Mother’s Blessing prayer, one of the TV crew ran up to two couples and cried NO! You are doing it wrong-listen to what they are saying, you do it like this! Later he told me he wants to be blessed next time! We currently have 780 couples registered to be blessed on November 14th, next Saturday. Each weekend, we are scheduling blessings for over 700 couples nationwide.